Beaver Lake Haven... formerly Blue Water Lodge. 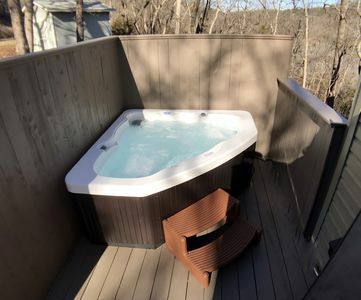 This property now has a PRIVATE Hot Tub! Kayaks! Peddle Boat! All INCLUDED. 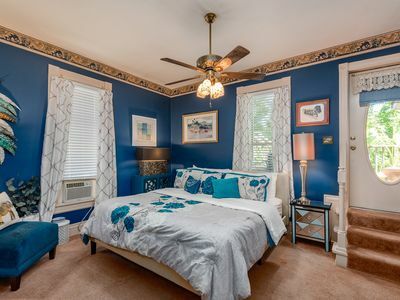 Please read this entire listing before booking. It's essential that you read the details to ensure that your stay at this property will meet your expectations. 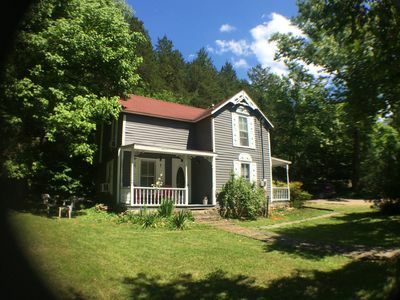 Every property in the area is different. Please check to make sure it has the amenities that you expect. Maximum # of Guests = 2. 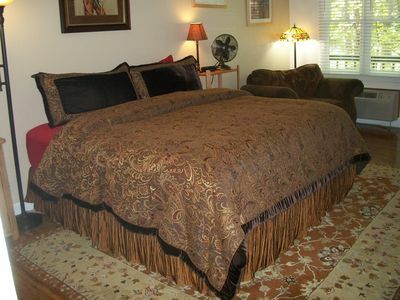 Master Bedroom is an open loft - King Dual-Adjustable Bed. 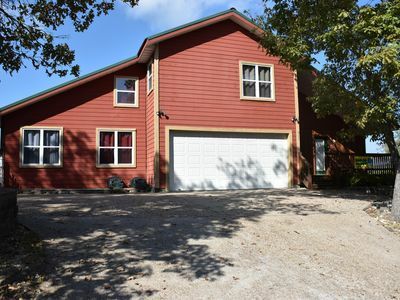 Full Kitchen with all appliances, including dishwasher. Charcoal Grill on rear deck overlooking Beaver Lake. This is the PERFECT lake front get away. Please compare the rate of this property to others with these luxury amenities and you will find that this property has significant VALUE. The property boasts waterfront access in a secluded DEEP WATER cove. 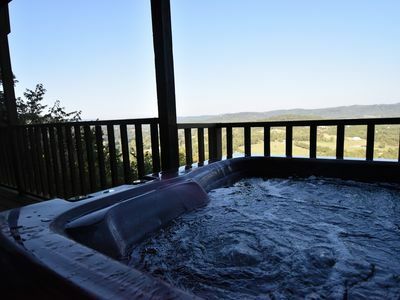 The Hot Tub is very private, The Kayaks are on the dock awaiting your arrival, and the fishing is superb. 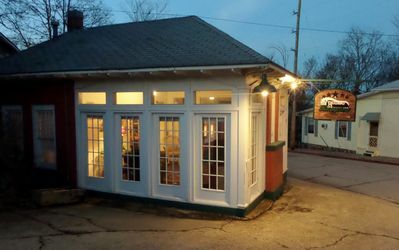 Beaver Lake Haven is only 12 minutes from Eureka Springs, providing you access to fine dining and entertainment. Scuba Classes, Mountain Bike Trails, and trout fishing on the White River are all minutes away. There is a Boat Ramp less than 1/4 mile from the property. Launch your boat and tie it at the dock. There is room for trailer parking. This is also a perfect place to stay for weddings at the the Thorncrown Chapel. 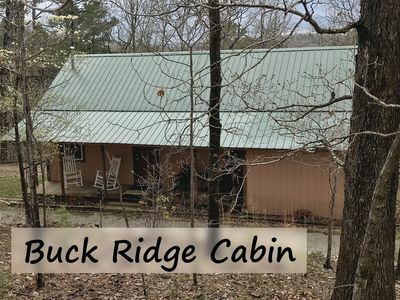 The cabin includes a fully equipped kitchen, dining room, a large deck for outdoor dining, and a large open loft. 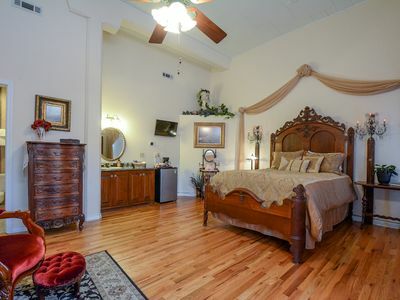 This is a beautiful couple's vacation home with vaulted ceilings and pine floors. 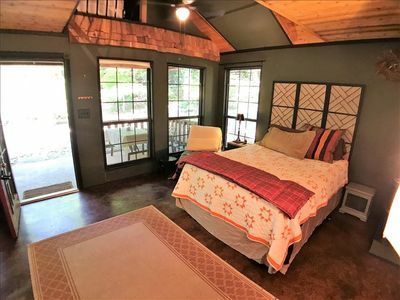 There is a full bath on the main level, and the loft has a convenient half bath. There is a washer and dryer for your convenience on the main level as well. 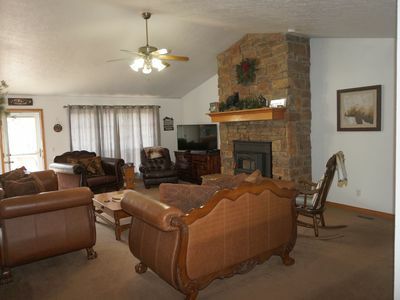 The living area has a comfortable power double-recliner, an electric fireplace and a large flat screen with STREAMING TV. 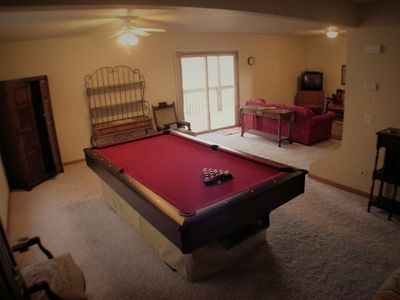 There is a second large TV upstairs. Both TVs are "Smart TVs" and have DVD/BR players. (Note, you may want to use your own Netflix, Hulu, Amazon Prime Video account, etc). Enjoy the hot tub under the stars. 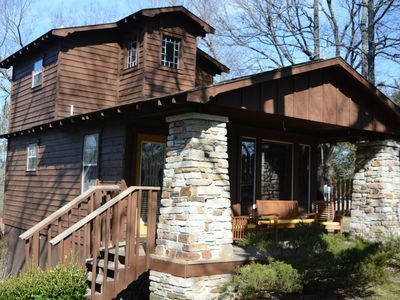 We have built a private retreat on the front deck that is slightly past the house, providing a view of the lake. The cabin offers secluded waterfront access with a staircase of 100 steps running to the shoreline. The boat dock provides a great place to swim, fish, or just soak up the sun. There is room to park your trailer and you may park your boat in the open slip. 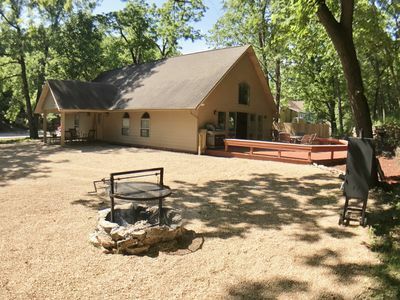 *Huge open deck nestled in the trees overlooking the lake with a charcoal grill. 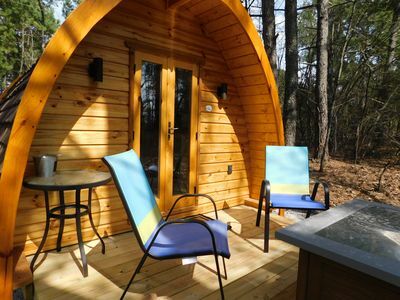 *OTHER AMENITIES: Our kitchen is furnished with a standard stove, large microwave, dishwasher, refrigerator with ice-maker and of course dinnerware, flatware, glassware and cookware. Enjoy a cook-out on the charcoal grill on the deck. 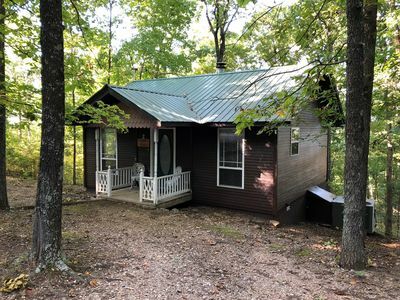 LAKE ACCESS: Beautiful crystal clear Beaver Lake is located approximately 50 yards directly below the cabin. 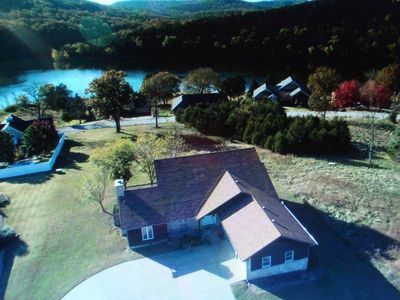 Enjoy swimming, fishing, boating and other lake activities on quiet Henry Hollow. NOTE: The terrain to the lake is steep. Please be sure to view all the photos on the site for pictures of the steps and lake access. THERE IS A PUBLIC BOAT LAUNCH ABOUT 1/4 MILE FROM THE PROPERTY. KAYAK, PADDLE BOAT & PADDLE BOARD are available for use by guests. Life jackets provided. 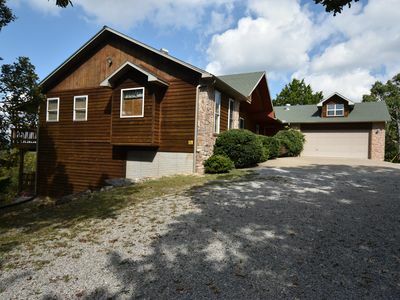 This home offers 24 hour security with a camera over the front door. 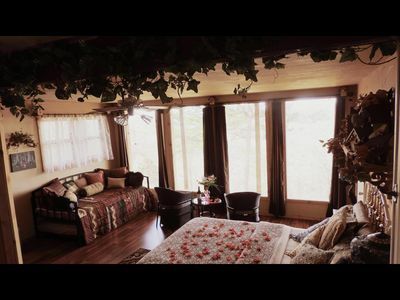 The Nest at 188 is a unique lodging/retreat located in Eureka Springs, Arkansas. 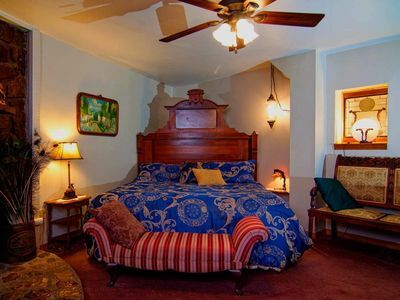 Romantic Anniversary Suite - Walk to the dinner train!